The New York Times whitewashed several Democrats’ ties to Nation of Islam leader Louis Farrakhan in an article that ran in Wednesday’s paper. Several congressional Democrats have ties to Farrakhan and the leaders of Women’s March have publicly declared their support for him. The Times’s article on Wednesday focused on Democratic congressional candidate Leslie Cockburn, a former journalist running to replace Virginia Republican Rep. Tom Garrett. Virginia Republicans have accused Cockburn of anti-Semitism over an anti-Israel book that she authored in 1991. The Times portrayed the accusations against Cockburn as emblematic of a larger battle on the Left. The Democratic National Committee’s deputy chairman, Representative Keith Ellison of Minnesota, has spent years trying to get beyond past associations with Louis Farrakhan, the anti-Semitic leader of the Nation of Islam. But conservative news media continues to try to tar Democrats by linking them to Mr. Farrakhan, and Mr. Trump has used his Middle East policies to try to drive a wedge between Jewish voters and the Democratic Party — even as openly anti-Semitic candidates in Wisconsin, Illinois and California run for office as Republicans. That paragraph was misleading in three ways. First, as The Daily Caller reported and as a Washington Post fact-check confirmed, Ellison actually misled the public for years about his relationship with Farrakhan. We’re talking about something that happened in 1995. This was the year that the Million Man March took off. People were attacking the march at the time. . . . Man, I’m telling you back in 2006 and before, I disavowed them. That’s the ridiculous thing about this, that we keep on having to answer this kind of stuff. WaPo awarded that claim “Four Pinocchios” — the worst possible rating in the D.C. paper’s fact-check system. Second, The NYT claimed that “conservative news media continues to try to tar Democrats by linking them to Mr. Farrakhan” and linked to a DCNF article. The NYT did not reach out to TheDCNF for comment and didn’t respond to a request for comment on this report. In addition to impugning this reporter’s motives without citing any evidence whatsoever, The Times portrayed reporting on Democrats’ Farrakhan ties as akin to a smear. Davis’ hometown paper, the Chicago Tribune, slammed the congressman for his relationship with Farrakhan in an editorial that cited TheDCNF’s reporting. 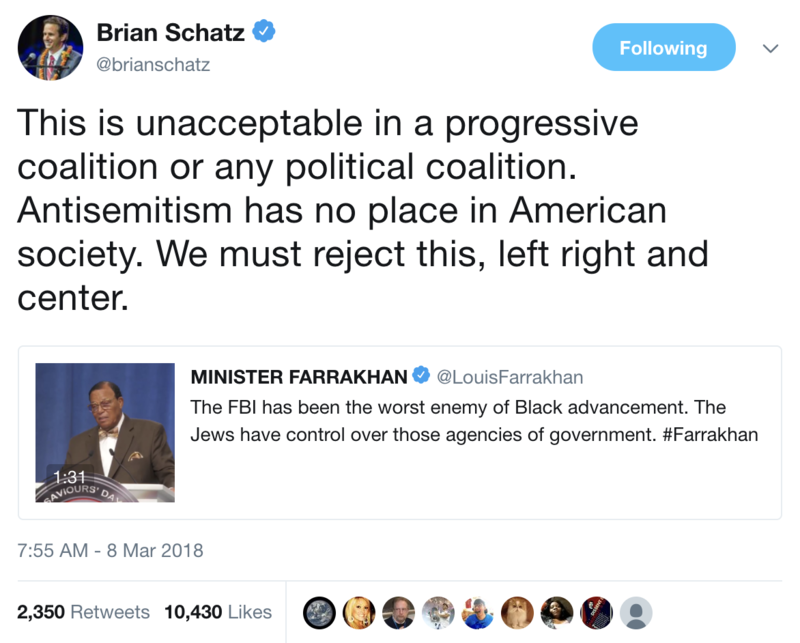 Democratic Sen. Brian Schatz of Hawaii called Farrakhan “unacceptable in a progressive coalition or any political coalition” on March 8 after Farrakhan again accused Jews of secretly controlling the FBI to persecute black people. “Antisemitism [sic] has no place in American society,” Schatz wrote. It took Davis just under six weeks to distance himself from Farrakhan’s anti-Semitism after praising the Nation of Islam leader as an “outstanding human being” in a Feb. 5 interview with this reporter. Third, The Times used fringe anti-Semites denounced by the Republican Party to downplay ties between Farrakhan and longtime Democratic members of Congress. The paper noted that “openly anti-Semitic candidates in Wisconsin, Illinois and California” are running for Congress as Republicans, but didn’t inform readers that Republicans have denounced and condemned all three anti-Semites, none of whom have a serious chance of winning election. Meanwhile, Democratic politicians who refuse to renounce their association with a prominent racist and anti-Semite remain influential members of Congress.